Martini glass wine charms by Wilma and Betty. 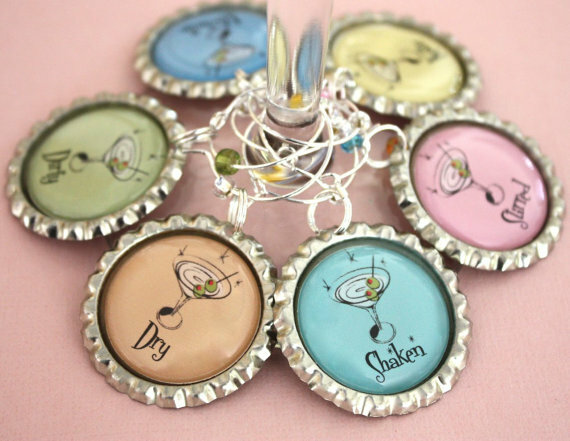 These pastel martini glass wine charms make great perfect party favors and are an ideal way to keep track of whose glass is whose. They can even be personalized with names. There are charms to designate stirred, shaken, dry, dirty, straight, and on the rocks, and they come in a wide array of colors. These charms are cleverly crafted from unused, flattened, silver-toned bottle caps and high-quality glass beads. Cocktail rim sugar by Dell Cove Spice Co. 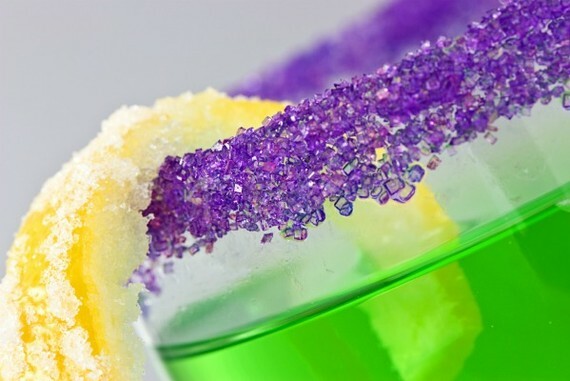 These brightly colored cocktail sugar rim crystals sweeten your glass rim and complete the look of your libation creation quite nicely. Blend customized cocktails—or mocktails, for that matter–like a professional mixologist and add the perfect finishing touch. The container of 2.5 ounces is enough to rim 8 to 10 martini glasses, and comes with recipes and instructions on how to rim a drink glass. Have fun wowing your guests with these delightful details, and if you have finds you would like to share, we’d love to hear about them!